Women in Clothes is the latest book I’m reading. And the best way to talk you about it, is throught the summary of its website www.womeninclothes.com. 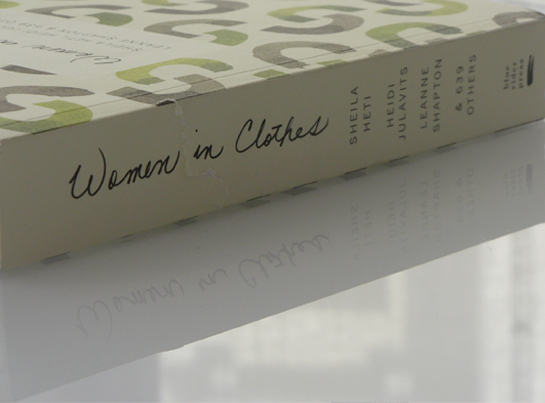 It says: “Through original interviews, conversations, surveys, projects, diagrams and drawings from over six hundred contributors – including Miranda July, Cindy Sherman, Elif Batuman, Mac McClelland, Lena Dunham, Molly Ringwald, Tavi Gevinson, Rachel Kushner, Roxane Gay and Sarah Nicole Prickett – Women in Clothes explores the wide range of motives that inform how women present themselves through clothes, and what style really means”. Sounds smart, doesn’t it? As Sasha Weiss has written in the New York Times’ review titled The Elements of Style, “Women in Clothes is part advice manual, part anthropological study, part feminist document”. Women in Clothes (que se podría traducir como ‘Mujeres Vestidas’) es el último libro que estoy leyendo. Y la mejor manera de explicaros sobre qué trata es a través del resumen que aparece en www.womeninclothes.com. Dice así: “A través de entrevistas originales, conversaciones, encuestas, proyectos, gráficos e ilustraciones de unas seiscientas colaboradoras –incluyendo a Miranda July, Cindy Sherman, Elif Batuman, Mac McClelland, Lena Dunham, Molly Ringwald, Tavi Gevinson, Rachel Kushner, Roxane Gay and Sarah Nicole Prickett– Women in Clothes explora el amplio abanico de motivos que influyen en cómo las mujeres se presentan a sí mismas a través de la vestimenta, y lo que el estilo significa en verdad”. Suena inteligente, ¿verdad? Como Sasha Weiss ha escrito en el artículo del New York Times The Elements of Style (Los Elementos del Estilo), “Women in Clothes es parte un manual de consejos, parte un estudio antropológico y parte, un documento feminista”. Posted in Books, Fashion, Trends. Bookmark the permalink.